Ping went the rear wheel, followed a moment later by another ping, and then two more in quick succession. There was no pattern to the noise, not the usual once-a-revolution of a wheel, or the regular squeak of a chain's tight link. This was erratic, unpredictable and disconcerting and we learned long ago that any unusual noise on the bike usually means trouble. At one of our stops I applied my totally unscientific approach to the problem. I grasped the spokes two at a time and squeezed. They moved. I did the same with the front wheel. They felt much tighter. I worried, the worry was infectious and soon I had Judy worried too. Was the wheel going to collapse? In theory it should have been fine. We had just had it rebuilt after splitting the rim in Spain. Now we had a new rim and new spokes, and a new problem. This was in north Somerset a few days ago, and we rode on wondering what to do. 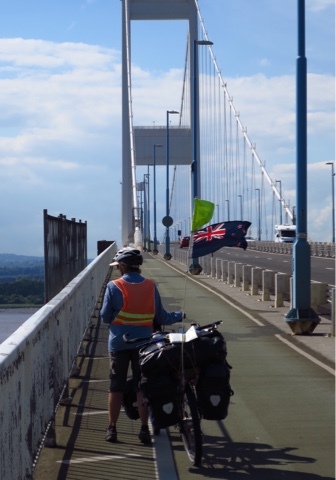 The noise was still there when we crossed the Severn Bridge into Wales and as we climbed wearily the last 7 kilometres to a farm campsite near Chepstow. The only cycle shop in Chepstow was closed the next morning (a Wednesday). It was time for action. We propped the bike on its stand in a very public square, and while Judy organised coffee I adjusted all 32 spokes in the rear wheel - tightening them by a third of a turn. They still felt loose, but I didn't have the nerve to turn them further. We finished our coffee, looked at each other and gave it a go. The wheel was silent - the only sounds the whir of the chains, and the thrum of the tyres. And there our problem was solved. The boss, Stuart, measured the spoke tensions and agreed they were low - very low, several at 10 somethings and one at 5 when they should all have been up around 20 to 25 somethings. While we had lunch, he tightened them and then tried to charge us a pittance. 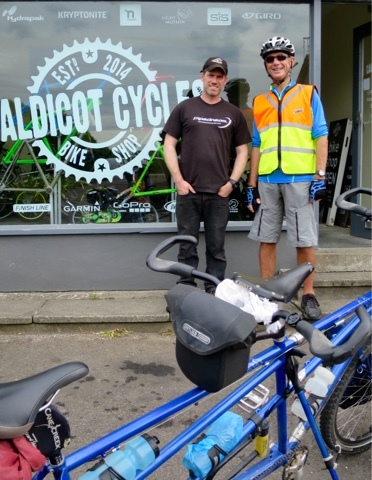 Outside Caldicot Cycles, South Wales, with Stuart who came to our rescue by tightening the spokes before they broke. The difference was immediate. If a laden tandem can feel lively, the Beast was transformed. Gone was the vague wobble in the corners, and we could feel every bump which was better than not feeling them. So far so good, as we rest up for a couple of days at a family friendly campground near Porthcawl on the south coast. How on earth are we supposed to get through this? 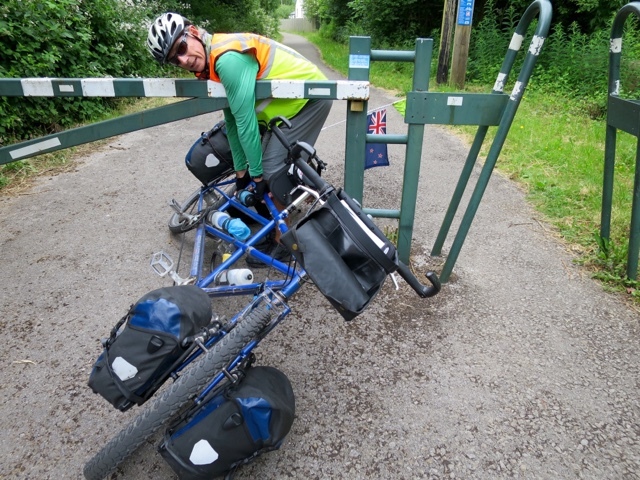 Cycleway barriers have made it difficult to continue on dozens of occasions as we approached and then left Pontypridd. Designed to keep motorcycles out, they are pretty effective against tandems. Here we try the down under approach, tilting the bike to pass the barrier arm. On two occasions the obstacles meant we were going to have to remove the panniers and lift the bike over, when help arrived unexpectedly. First, a group of five mountain bikers all grasped the loaded bike and manhandled it over the barrier. The second time, two cyclists - one with more rings in his face than you could count without staring - also managed to lift the bike over. They both looked as though they would need physio the next day, but we were very grateful. Judy models her other pair of cycle shorts. She has worn out the backside in her usual pair (right hand) and they have been discarded. Who says the Stoker doesn't pedal? * Rear wheel rebuilt after splitting the rim in Spain. * Spokes in rear wheel tightened at 300 km after rebuild. * New front wheel with Son 28 Dynamo hub from Thorn/SJS Cycles who manufactured the tandem. This will enable us to charge our GPS and Judy's cellphone while we are riding. * New Cinq5 electronic device (still to be fitted) which will provide a USB port for our gadgets. * New Cinq5 buffer battery, to even out the flow of power from the Dynamo to the device being charged. * New pump with a gauge to end the guesswork over our tyre pressures. * Two folding stools for use at campsites. 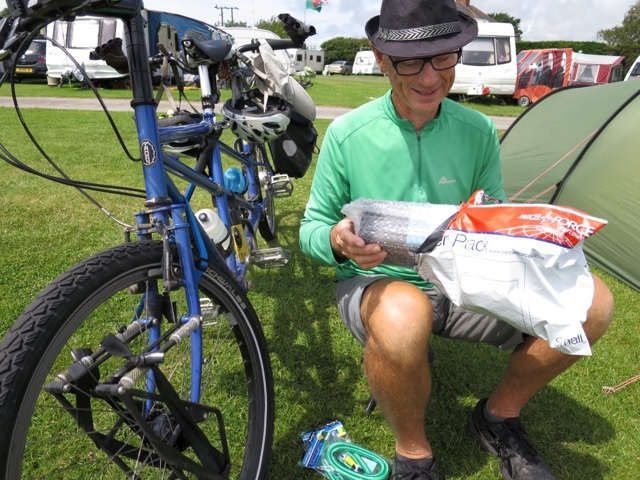 New electronic goodies arrive for us at a campground near Porthcawl. Once we get the Dynamo hooked up we should be less reliant on campgrounds for power to charge our GPS, phone etc. Here I am pumping up the front tyre after picking up two thumb tacks on Cycleway 41 near Barracks Lane, Shirehampton. The tacks must have been thrown down deliberately by someone with a grudge against cyclists. We do sense some animosity between motorists and cyclists. The biggest grudge by drivers seems to be that too many cyclists hog the road and make no effort to move over - even riding three abreast on busy roads. And cyclists say they have as much right to be on the roads as cars, and that drivers fail to show them common courtesy. We are changing our attitude to GPS George. After the trials of Portugal and Spain, he is winning his way into our hearts. As Judy the Stoker says,"George is now elevated to head navigator. If he's happy, we're happy." We think there are several reasons why he has gone up in our estimation. We have configured his brain a little differently, the maps of Britain that we have downloaded for him seem to be of a higher quality than before, although they come from the same source (OSM) and we have lowered our expectations about his abilities. Whatever the reasons, living with George is better than before. Captain: "Is George happy (with the direction we are going)?" 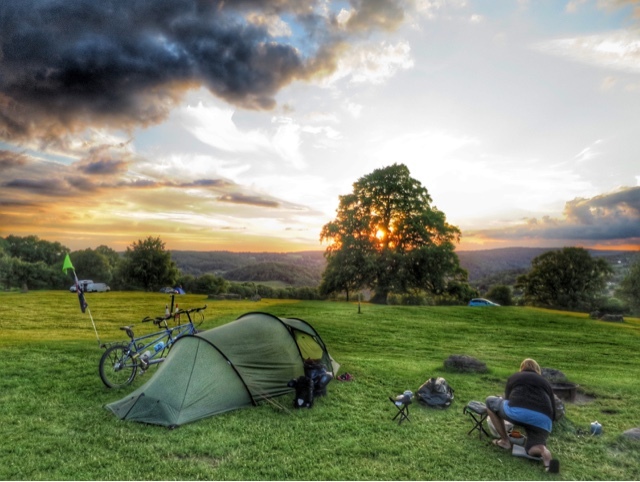 A favourite campground - Beeches Farm Camp - 8 km north of Chepstow and looking over Wales. Pity about the climb up to it. "I've lost the will to live," on reaching a campsite after a long climb at the end of the day. "I hope this is for eyes - it's in Portuguese," Judy uses expired eye drops. "Pedalling downhill in that cold I could feel the wind on my legs - brrrrrr. Tells me I need to shave them." "So we're getting close to Ireland then. What did we have for breakfast? Boiled potatoes," Judy ruminates that the previous night's leftovers get eaten at breakfast. 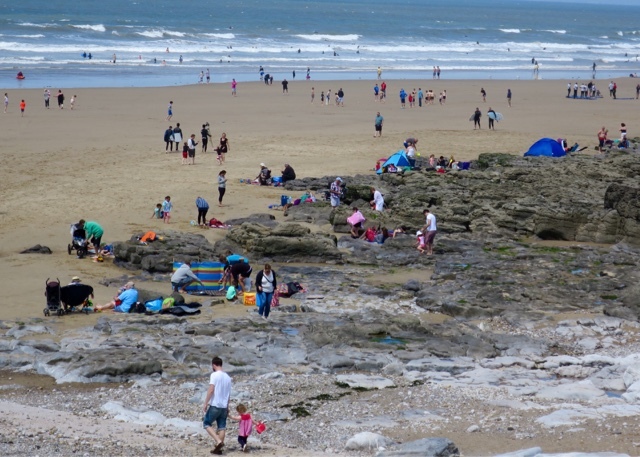 Rest Bay is just around the corner from Porthcawl. It's a popular spot for surfing though there weren't too many board riders out the afternoon we visited. While we have been cycling over the past three years, a number of friends and acquaintances have suggested we would be better off buying a camper van for our travels. We nod and smile and say nothing much and then out of earshot later we ask ourselves what is it that people don't get? Perhaps because they can't see themselves cycle touring, they want to impose their own ideas about travel on us. Or is it that they are genuinely concerned for our well being? 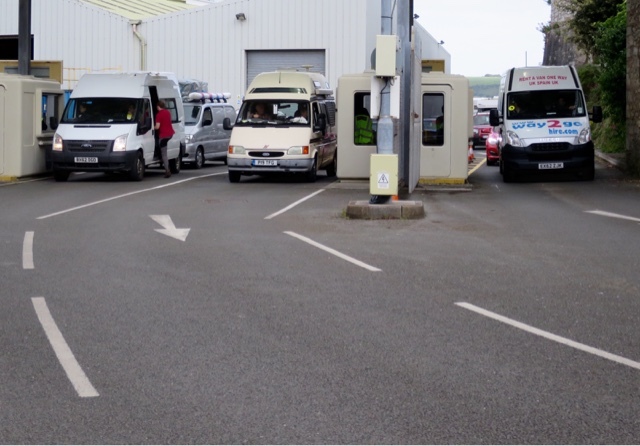 Three in a row - camper vans pass through security at Plymouth, England, after returning from mainland Europe. Sometimes they refer to the comfort of a camper van, or a motor home - the camper van's big brother. It's certainly true a camper van provides features no cycle tourist gets to enjoy - good protection from the weather, home comforts such as a shower, toilet and a permanent cooker, along with some of the benefits of a car including the ability to cover long distances relatively quickly. Some of the advice relates to our personal safety - the risk of an accident or a threat to our security. So far we have managed ok on the road and no one has sliced their way into our tent with a knife in the dead of night and tried to murder us in our sleeping bags. The latter is not something we even think about. Why would they bother? We are pretty low rent with not a lot worth flogging. To us, the very idea of a camper van instead of our tandem and a tent is ridiculous - it's like comparing apples and oranges. So let's run through some of the differences. 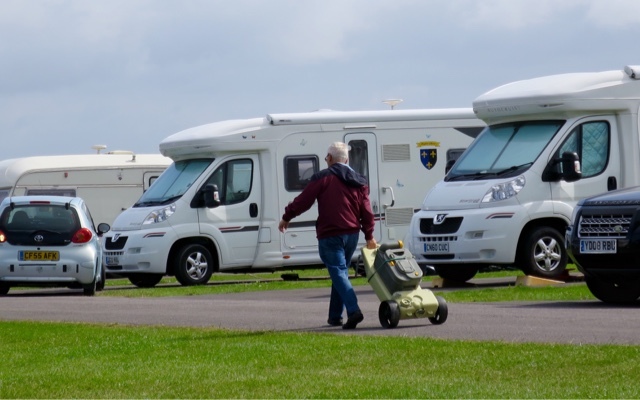 A camper van/motor home is a form of motorised transport. It requires no physical effort other than the turning of a steering wheel. In contrast, our tandem doesn't move without us pedalling - burning calories every kilometre of the way and maintaining or improving our fitness as we go. This is particularly important for us. As we cycle into our mid 60s we are becoming increasingly aware that we need exercise to maintain health, and cycling with its low impact on joints is as good a way as any. So - apples and oranges? Think physical exertion for four to six hours a day compared with sitting in upholstered seats letting an engine do the work. There is also a comparison to be made about the "style" of travel, the difference between a bike and a camper van. 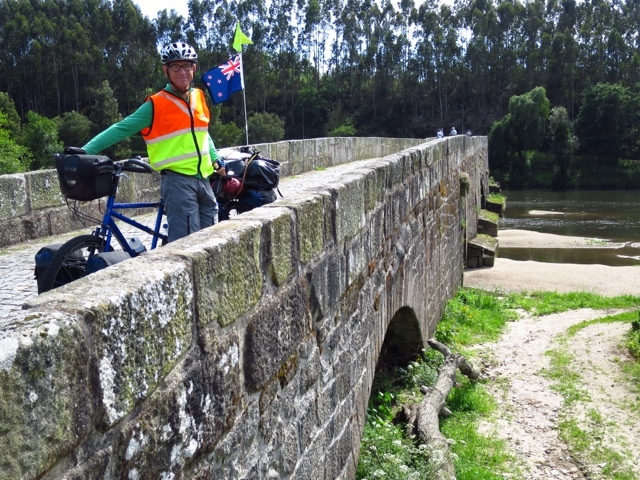 The toilet trundle - one task that we cyclists do not have to concern ourselves with. The latter is capable of covering whole continents in weeks if not days - its occupants conveyed in a steel and glass box that insulates them from the very world they are travelling through. In contrast, two cyclists on a tandem don't travel "through" that world - they are "part" of it. They feel every bump in the road, struggle up every hill and can claim the satisfaction that comes with cresting a long rise at the end of a long day. On the way, the sun or the rain beats down on them, and they cram themselves with food not simply to take a break from driving but out of necessity. Here we are camped at Santiago de Compostela, Spain, alongside several camper vans. 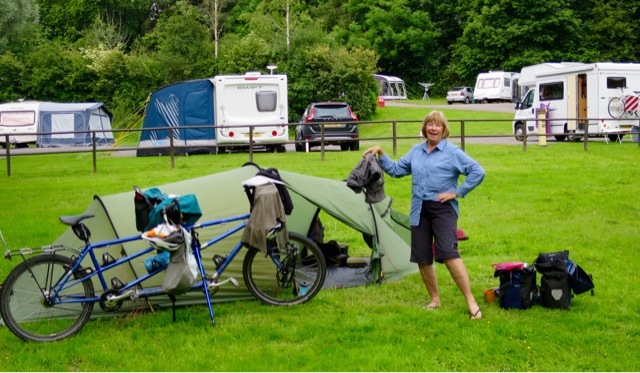 While they offer certain benefits, travel by camper van has very little in common with cycle touring. There is another huge benefit to being "part" of the world, rather than travelling "through" it. Cyclists have lots of human contact. On a tandem, it's impossible to cycle through a village without receiving a few friendly waves, a greeting or two and maybe even a small round of applause. Builders on construction sites are often amongst the first to greet us, but friendly gestures come in all sorts of ways. Here's an example of what we mean. Recently in northern Spain we stopped at a quiet cafe in a nondescript village as rain threatened. As we drank our coffee, several men stopped by the tandem to examine it. When we rejoined our bike we went through our usual routine, showing off some of the tandem's features to the onlookers - its couplings which separate the frame so it can be boxed for air travel, its smart Rohloff hub with its 14 gears and Judy's seat post which is designed to absorb some of the impact from bumps. As we fastened our helmets, I said to Judy, "show time," and we both knew what I meant. We needed to make a smooth getaway. "Can't let the team down." But muff it we did, with a low speed wobble brought on by performance anxiety. To our delight, we suddenly felt a steadying hand on the back of the tandem. One of the onlookers was running alongside. We gathered speed, our assistant released his hold and a small cheer went up from the audience. I pinged our bell, we waved over our shoulders and were gone. It was a small moment and we can't read much into it - this was not a deep and meaningful conversation that opened our eyes to life in a foreign land but it does reflect the goodwill a laden tandem and a couple can engender. How do you get that response shut up in a steel and glass box? Riding a tandem means you can go places blocked to other traffic. This bridge in northern Spain is part of a cycle way. Riding a bicycle also means we ride a different road from those apple-like camper vans. Motorways are no go - though we did try one by accident recently - and we seek out quiet back country roads. We seldom see a camper van on these roads and without clearly marked road signs we are thrown on our own resources navigating with map and GPS - doing what we can to avoid traffic and often adding kilometres to our ride. While that additional riding may seem a pain to others, for us it usually doesn't matter - unlike a motorist trying to get from point A to Point B as quickly as possible, we are in no hurry. It's all about the journey and less about the destination. In the process we get to enjoy the sights and smells of the countryside - we talk to cows, tell dogs to keep their fur on, breath in lungfuls of rose scented air and put up with farmyard pongs. There are other pluses about the tandem - for example, its low impact on the environment compared to a motor vehicle. We do not have the running costs associated with a motor vehicle - no petrol/diesel fuel and no regular workshop bills. Occasionally we buy new chains and tyres and I fit them myself, but that's about it. 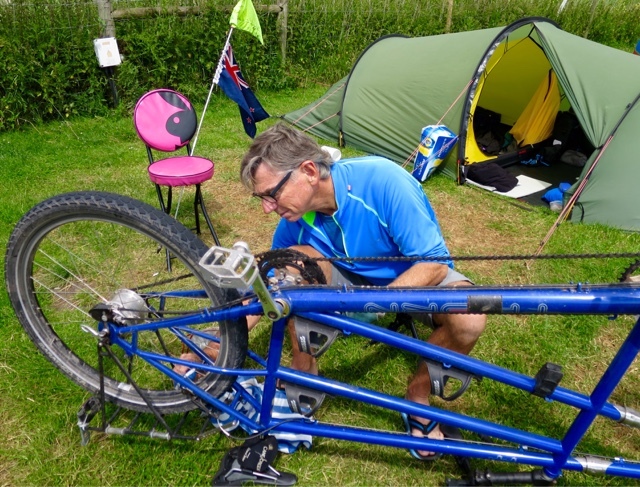 Unlike a camper van, the tandem requires very little capital outlay. It leaves us with money in the bank. And we can explore a new part of the world each year by flying to our destination with the tandem packed in a couple of recycled bike boxes. What on earth would we do with a camper van? As for the future, we see no reason to change our mode of travel. There are plenty of cyclists out there in their 70s and beyond. It may be that we choose to ride shorter distances and look for less hilly terrain but cycling is something we wish to continue. It comes back to apples and oranges. We are perfectly content with an orange and happy to leave others to munch on their apples. On a good day it's hard to beat the joy of camping. In a downpour it can take resilience. 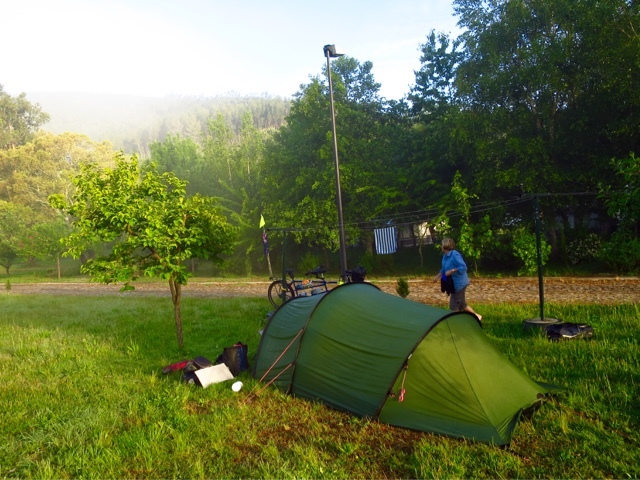 "You need your lumps felt," campground manager on learning we enjoy cycle touring. "Maybe I need a pair of those leg warmers for Britain", I said to Judy the Stoker, imagining myself in a pair of sleek Lycra tights with a fluorescent strip on each calf and a well known logo plastered down my thighs. "I saw them on the Internet for £19 but they might be more expensive in a real shop." There was silence and I let the matter drop. Practicing an Irish jig ahead of my bound-to-come invitation to join the Riverdance crew. It wasn't until we were in London a couple of days later that Judy brought up the subject herself. "How about a thick pair of women's leggings? I'll bet they would be just as warm and they won't cost £19. And if it's never cold enough to wear them it doesn't matter." So that's how we came to spend most of a precious afternoon in London visiting a succession of department stores. At first nothing was suitable. 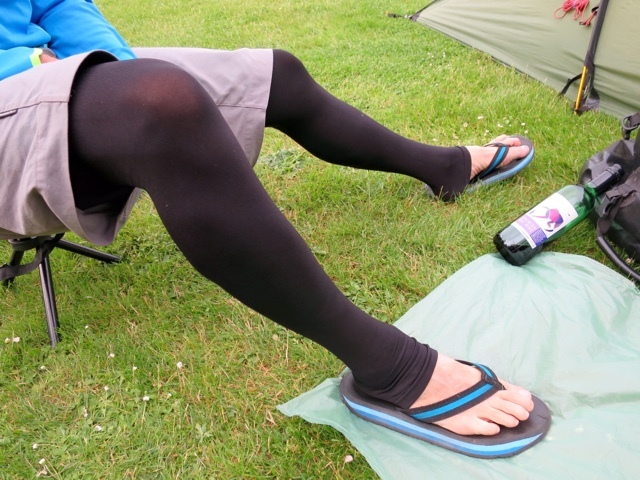 It was summer and no-one was selling heavy duty winter leggings. In each shop - Boots and Marks and Spencer and a couple of others - I hung back, reluctant to be seen in the women's tights department and even more reluctant to let it be known we were shopping for me - the Captain of the Beast of Bridgwater. But in H & M in Oxford St, things looked more promising. Judy was rummaging on a shelf when she held up a packet triumphantly. "Would these be very warm, how big is XL?" The woman looked nonplused but did her best. English was clearly her second language. Eventually she spelt it out. "I don't work here. Maybe that man over there help, but what you think of these shoes? You think they suit me?" Triumph turned to confusion, then bewilderment on the woman's part when she learned the leggings were for me. I looked for the emergency exit. It took a certain amount of persuasion plus my share of a bottle of cheap Spanish wine to climb into my new leg warmers. But there was no stopping the Stoker. 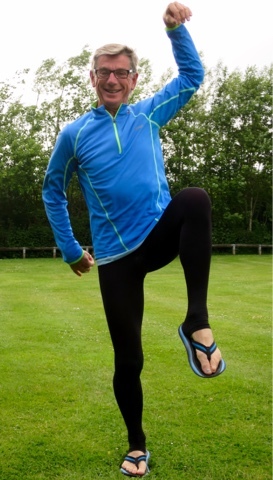 The man at the counter agreed that 200 denier leggings would be very warm, even in an English Summer. And he regained his composure quite quickly after learning that they were for me. So now I have my leg warmers. They don't have a stripe or a fancy logo, but It doesn't matter really because it's not cold enough to wear them. We were in Spain when we started getting the warnings. 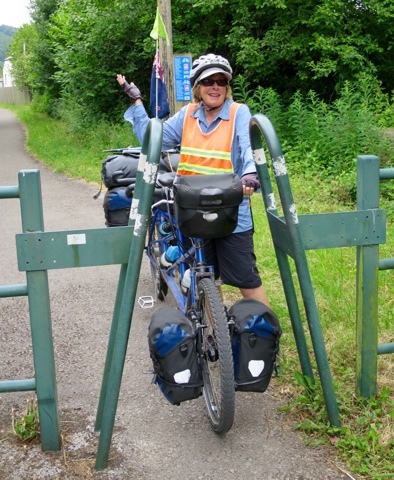 "I wouldn't cycle in England if I were you - it's far too dangerous," said one Englishwoman. "Many people don't like cyclists," said another. "It's not like here. In the New Forest they were so fed up with cyclists they threw tacks on the road to puncture their tyres." 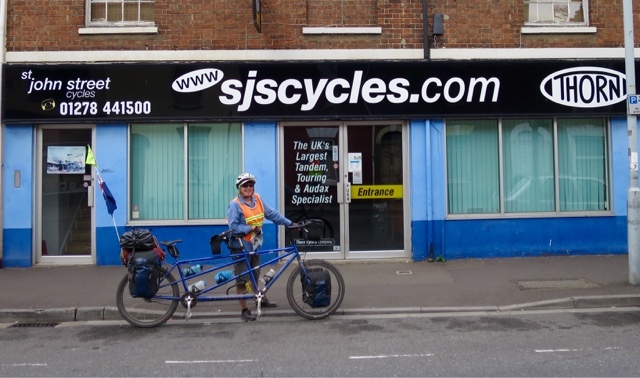 More than three years after buying our tandem - the Beast of Bridgwater - from SJS Cycles in Bridgwater, we returned to say hello. It was a Saturday and the shop was closed. Maybe they were cycling. Well, our experience in our first few days cycling here is completely the opposite. Drivers almost to a fault have been courteous, slowing down behind us on narrow country lanes, patiently waiting for an opportunity to pass. When they do slip by, we acknowledge them with a friendly wave and get one back. It may not be the same in big cities, when cyclists and drivers jostle for position on the morning commute - but so far so good. Path on the Taunton - Bridgwater Canal in Somerset. We shared it with walkers and other cyclists and found everyone patient and prepared to get out of the way of our tandem (perhaps not surprising given its size and weight). However, that friendly reaction is just a small part of the story. 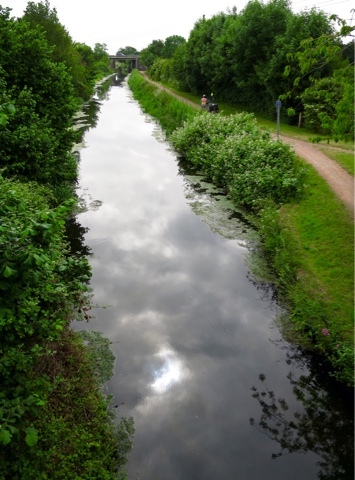 The real bonus of cycling in Britain is the National or Regional Cycle Network (NCN), more than 20,000 km of routes which crisscross the U.K. - sometimes on roads, sometimes on specially built tracks or on old, disused railway lines that have been repurposed. On the Devon Coast to Coast. It passes through this cemetery in Ilfracombe on the North Devon coast. 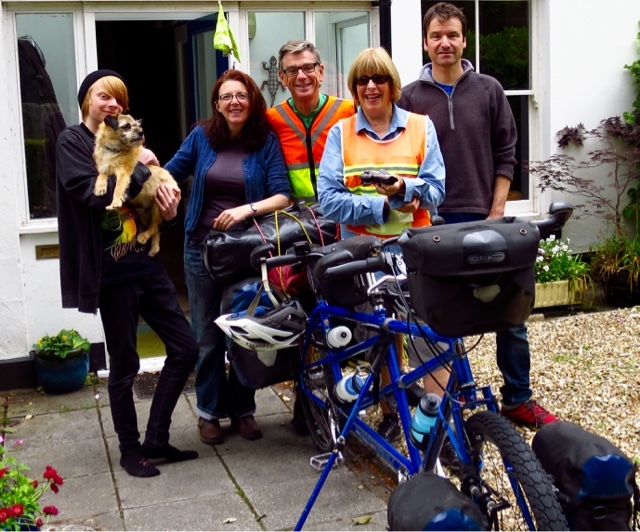 We've just finished riding the 158 km (99 mile) Devon Coast to Coast cycle way from Plymouth, via a wonderful break with family in Tavistock, north to Ilfracombe on the edge of the Bristol Channel. 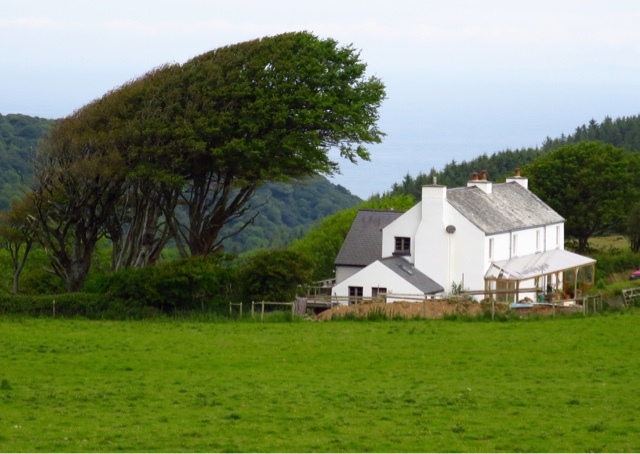 The Coast to Coast takes in Dartmoor, the valleys of three rivers and the estuaries and beaches of North Devon. Jack, Harvey the dog, Cathy, Mike, Judy and Mark at Tavistock. Much of the route is on traffic-free converted railway paths. It's well surfaced though there are a couple of short stretches where the track is rough and unfinished and we pushed the tandem. We found campsites and food when we needed them, and the weather was kind. 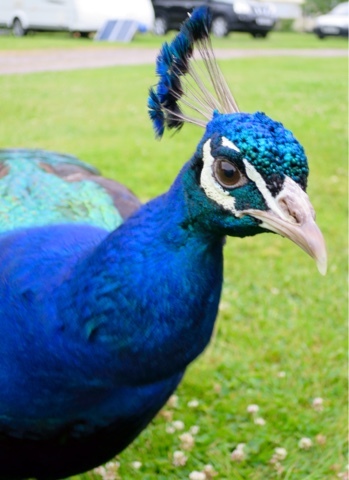 A peacock joins us at our campsite near Taunton, Somerset. It was cycling at its most relaxed, and for anyone contemplating a U.K. cycle tour do not be put off by talk of bad tempered motorists. So far we have not encountered them, and there are excellent opportunities to ride where there is little or no traffic. As our Coast to Coast ride was nearing its end we met four cyclists coming in the opposite direction on a 100 km (60 mile) day ride. 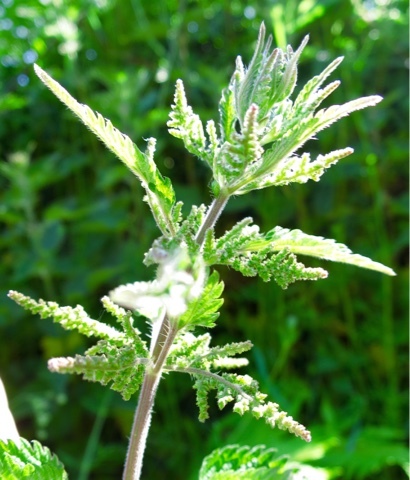 Stinging nettle is everywhere on country lanes. We have both been stung several times when we have pulled over to allow traffic to pass. After the usual exchange of pleasantries, we sought their advice on which way to go once we reached Ilfracombe - stick to the coast as we work our way East and then up to cross the Severn Bridge to Wales, or cross Exmoor. To us, both seemed hard work with lots of short but very steep climbs - the sort of riding we find tough on the tandem. 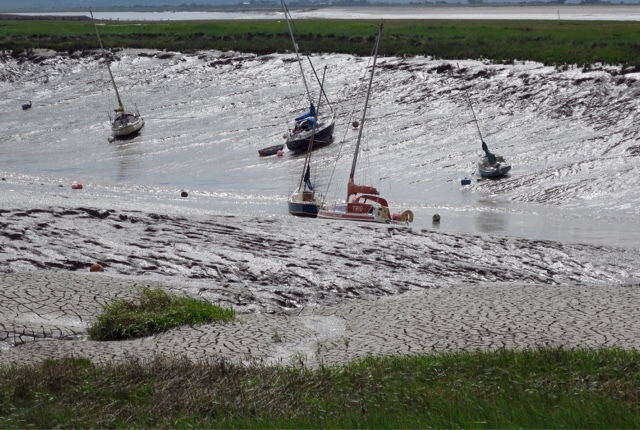 Boats aground waiting for the tide to come in near Burnham-on-Sea. The tidal range here can be more than 11 metres and the locals say only the Yellow River in China has a greater tidal range. Beach goers who wade out at low tide have to be rescued by hovercraft - the only craft capable of not getting trapped in the mud. 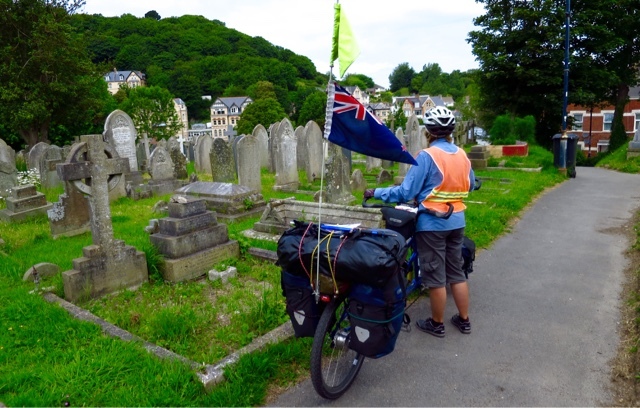 Opinion was divided, and the best bet seemed to be to go to Ilfracombe and stop cycling. That's not an option so we have decided on a compromise, following the coast to Combe Martin before tackling a steep climb of more than 300 metres to head inland on the sometimes narrow A399 where the drivers were as polite as usual. This startling sculpture is by the London and Devon based artist Damien Hirst. 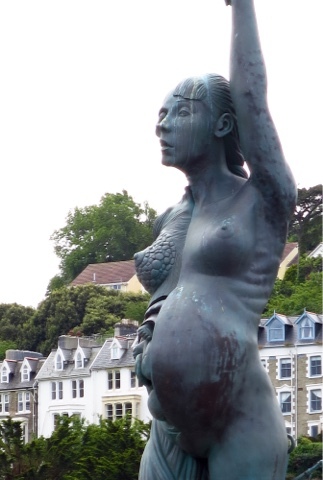 It stands on the foreshore at Ilfracombe, at the end of the Devon Coast to Coast cycle way. 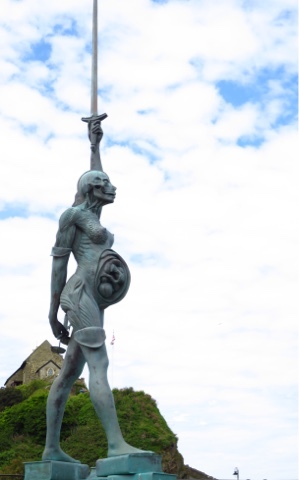 Entitled "Verity", it stands 20.25 metres tall and is said to be an allegory for truth and justice - the upright, defiant sword and behind her back the scales of justice. A cross-section of her head and torso reveal a developing foetus in her womb. We are camped near Bratton Fleming and tomorrow we will cross Exmoor on minor roads which are part of the NCN. It will be the quickest route and we like the sound of those wide open spaces. Sculpted by the wind, this tree shows the prevailing wind is anything but gentle. We crossed Exmoor in cold, windy weather with very poor visibility - not what we had expected at all. While it would have been nice to get good weather, we told ourselves that we were seeing Exmoor with lots of "atmosphere". 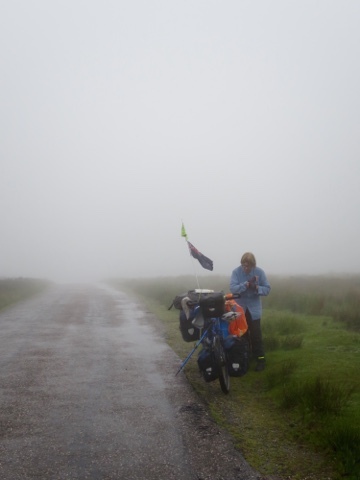 Judy adds another layer of clothing as we cross Exmoor in cold, wet conditions. Despite the weather, we had a great day's ride.